So im working on a campaign setting guide that starts again in 1356/7 DR. I was wondering how to reconcile the different cosmologies, magic, species origins, and divinity theories when i realised that any attempt to make something that fits them all to be a new baseline would end up pleasing no one. So i thought why not include them all. So what im looking for is all the cosmology theories that you guys can think of (including homebrew if you like) and some justification for why that is correct (theory and examples please). 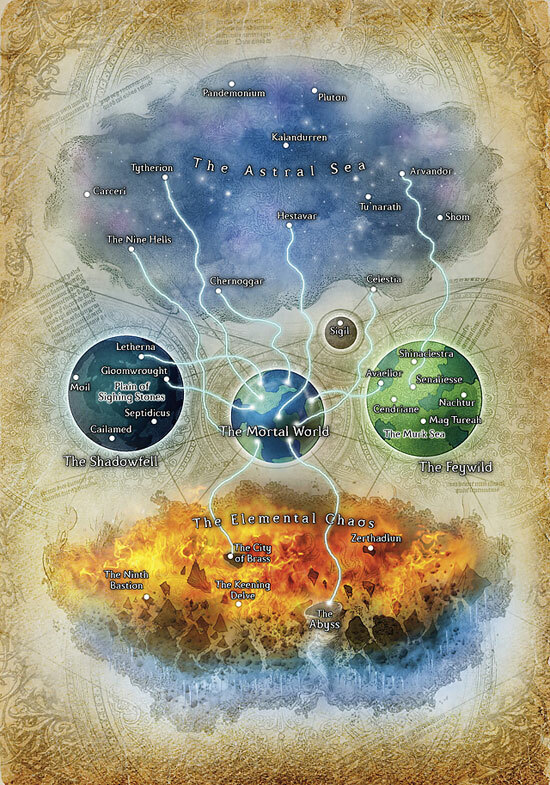 So ive got the great wheel and the world tree (although if someone could explain how that stupid tree is supposed to work id be grateful because i never understood it). Then ive got my own theory which is more of a fluid sphere with bridges. Are there any other official or homebrew ones that people care to propose. Just so you know if you propose something then i might take the idea and include it, so dont mention anything you want to keep secret. One of the biggest things to keep in mind is that infinite planes are, by definition, infinite -- so they really can't exist in any kind of defined structure, because structures involved boundaries. That said, I favor the Great Wheel. My perspective is that the planes of the Wheel kinda bleed over into each other and overlap; so they don't have explicit boundaries, but traveling far enough in one direction would eventually lead to another plane (in theory). It's not that they're on an actual wheel shape, but that's just the way the connections between them look if mapped out. Spinning it that way, the Tree is just another map... And if you say some of the 3E-intro'ed planes are simply regions or planar layers, within the 2E planes, then you reconcile both. That's a really cool spin on it... I wonder if it's possible to create a map where both the Great Wheel and the Tree hold true. Baseline in 4th edition (not sure if this was used in FR) had deities having their planes sitting like planets in the Astral Plane. The Astral was the organized part of existence, as opposed to the Elemental Chaos, which was home to the elemental planes and the Abyss. The material plane & it's reflections (the Feywild (Faerie) & the Shadowfell (Shadow)) were in the middle, as were demiplanes like Sigil. I don't recall any bleed-in between planes, you had to travel across the Astral Sea or the Elemental Chaos in ships, or find a portal, unless my memory is failing me. I do remember the planes being associated with colours, and they occasionally put out these colours across the Astral so you could figure out which direction to go... but the details evade me. Wow that bleeding thing is exactly how ive got my elemental planes set out except that its an infinite sphere and the elements of earth air fire and water occupy a quarter each. These regions of the pure elements move about and into each other and where they meet is where we get the para elemental planes. I do intend to just propose a bunch of theories and rational and how they work on FR and then let the DMs just pick the one they want without saying which is true or not. Im going to do the same with magic and even some of the timeline. That way its all down to the DM (which it always was, but some just didnt realise it). My thinking is that the Tree could be justified by saying that that the domains and shared regions lie on the larger planes of the Wheel, but are either more well-known to folk of the Realms or slightly more accessible from the Realms, so this led to the mistaken (in-setting) belief that's what the planar structure was. Whenever possible, though, I'm going to default to the Wheel and 2E planar info. What little I knew about the planar structure in the 4E era I did not like, so I don't know enough about it to try to spin it in. I tend to disregard it as much as possible. I would say, though, that they Feywild is either a layer of Faerie or a plane that shares many similarities with, but is not, truly Faerie. And the Shadowfell would just be the layer of Shadow closest to the Realms. In my FR campaign, my inner planes are like those of the 2e era, i.e. The four basic elemental plane plus the para-elemental planes between them. I also have the quasi-elemental planes between the elemental planes and the positive/negative energy planes. As for the outer planes, I also prefer the great wheel model but in addition, the various gods' domains (detailed in 3e) are located within the outer planes, rather then being planes in their own right. I.e Banehold is in Acheron and The House of the Triad is in Celestia. That's my spin, too -- the 3E domains are just divine realms in 2E planes. I like the idea of border areas bleeding into each other too. The 5e DMG has a nice diagram of the inner planes which I like. For example, it has a border region between the plane of ice and and plane of water known as the Sea of Ice. My group was recently stranded on a giant iceberg in the Sea of Ice..but that's another story! Well these planes are nearly infinite (so vast no one has ever found the edge kind of infinite) and when i imagine them moving and bleeding into one another i figure that happens slowly over millennia (like continents). So that sea of ice is a geographic feature that has occured in an area where the elements have bled and mingled into one another and it may have lasted for a million years such that everyone thinks it is permanent. It is however moving, growing and eroding all at the same time. It might one day disappear altogether but that doesnt make it a separate plane (in my version). It just makes it a vast (to humans near endless) feature that lasts for a long time (to humans its forever) and so foolish sages that think they know everything describe it as a plane in its own right. But thats just my theory. Im going to research all the ones mentioned and do a mini article on them penned by a sage or authority on the planes. That way they could all be right or wrong in some way. My thinking for planes bleeding into each other is that it's not a time thing, but a distance thing. So if you're in Elysium, at its heart, everything is all Elysium-like. You start heading in the direction (kinda-sorta) of the Happy Hunting Grounds. Eventually, your surroundings aren't quite full-on Elysium, there's a little bit here and there that brings to mind the Happy Hunting Grounds. And then a little more. And gradually more and more, until you look around and realize you're in the Happy Hunting Grounds. It's the same as going from mountains to plains -- first it's mountainous, then lots of big hills, then gentler hills, then gradual inclines, and then it's all pretty much level ground. No sharp boundaries, just a blurring/softening of features. "Reality is defined by mortality" - that's my rule-of-thumb. Basically, what that means is that a mortal's reality is governed by their beliefs. There is NO 'Great wheel' - although one might argue it's 'realer than the rest'. There is also No Tree... only Faer�nians preception of a Tree. Ordinary mortal minds can't comprehend 11-dimensional space, and thus we get these Cosmological Models (established with Dogma) that a mortal can understand... even though they are far from 'correct'. The people of Faer�n believe in The Tree, thus, its real for them, and they are governed by the rules that apply to it. A person from Oerth (Greyhawk) believes in The Great Wheel, which is the 'default' setting for the multiverse (its the cosmology actually believed in by the folks who live there, hence my earlier statement "realer than the rest"). People from Greyhawk would follow the Great Wheel (Planescape) rules. Thus, a party of personages from different worlds (and beliefs) might have trouble traveling together, because some may be able to cross dimensional barriers others cannot (because they are each experiencing their own, personal reality). After spending a certain amount of time on a world/plane or within a new 'Faith', a person will re-acclimate to the universe as their perception of it changes, and they will be able to follow the 'new rules' (Thus, someone from Toril living in Sigil for a time would start 'seeing' the Great Wheel for what it is). For example, someone leaving Marvel Earth and traveling the astral would be walking along the 'Cosmic crossroads'. Another person might come along and wonder why they are sticking to such a specific path, while that Marvelite would be wondering how the other person was floating in thin air. I could actually see fiends having fun with this - forcing (psionically) their own perceptions onto someone else, and watching them 'fall through' a non-existent bridge, etc. That's the major caveat to my own Cosmology - nothing is what it seems, and everything a person believes is real to them, in much the same way you can fail to disbelieve an illusion (so if I wanted to wax philosophical for a moment, the entirety of the Multiverse is just an 'illusion' created within the mind of GOD.) This same thing would hold true for gods themselves - mortals see what they expect to see, and each mortal might see something a little (or a LOT) different. Also, when a god is outside his 'comfort zone' (a setting in which he has an established following), his aspect, and even personality, might change, depending upon what the 'locals' believe to be true. I am sure there are some (orc?) worlds where Grumsh is worshiped as the 'almighty', and Corellon takes a role rather like Asmodeus (Satan, Lucifer, etc). And on such a world, those things would hold true. DOGMA is an extremely powerful force, and changing it could change a god itself, which is why deities tip-toe around mortals, even though they are vastly more powerful than them. Destroying a god could be as simple as wiping out their followers, or changing a few lines in a book (and making everyone forget the original... we have at least two examples of that in canon that I can think of off the top of my head). On a world like (D&D) Earth, or even in FR, one god could have multiple 'aspects' depending upon the region & race of the believers. So my "Reality is defined by mortality" rule boils down to this - you can fudge anything with it. You don't need 'hard rules' because there really aren't any. That's how I think 'all things divine' should work - its malleable. I really don't want to get into my 'theory of Everything' again (I've loaded-up threads with bits & pieces of it over the years). Basically, I use ALL cosmologies/mythologies, and interweave them in such a way that they all hold 'some truth' (including the Judaeo-Christian model). I also blended it with String Theory... because I'm cool like that. That's a really intriguing take on it Markustay, I hadn't thought about it like that before. It appeals to my brain muchly. Is there a good thread around where you expand a bit more on it? Also, have you ever incorporated this interpretation into play at the table (beyond perceptions on the material plane)? I'd be interested to hear about how such a thing would operate in a campaign with planar travel occuring. I have cosmology similar to lot of you here. Great Wheel where god's domains are only part of specific outer planes and World Tree is just a mortal's map to those domains as they use them prominently. As for structure I have sort of primal Elemental Chaos in center surrounded by six Elemental Planes and on their borders Quasi and Para-elemental Planes. next layer is Ethereal Plane that borders Material Plane. Next is Shadow Plane then Astral Plane and finaly Outer Planes. Specific for me is that alignment based Outer Planes are aligned with Elemental planes. I tend to go with an approach similar if not identical to Markustay. I like to think that concepts like Cosmology and how the planes are arranged are beyond mortal or even immortal understanding. All these wheels and trees and other concepts are simply attempts by the mind to explain what cannot be explained. Now you have scholars out there that have offered their established opinions on the matter, and many "learned" folk have snatched these concepts up and cling to them as Dogma. This is why the Wheel and Tree theories are so common. The idea has created expectations which create perceptions that establish the reality a planar traveler steps into. You also have powerful entities like Gods, Demon Lords, and Arch-Devils who have power enough to force their perception of reality onto others. This is why these beings have domains that fit their personal style. The only problem I had with this is the idea that the Elemental Chaos is a jumble of all the elements all mixed and tossed together. My solution for this is that over the eons, the elements drifted, pushed appart, and were somewhat "ordered" by the beings living there. This results in 4 general regions of element with LOTS of bleed between them. Thus you have regions of "pure" Fire and Earth, but where these regions start to come "close" to one another you have lots of lava and mixing of the two. The same happens where other regions meet. I still have the Abyss at the "bottom" of all this, a region of pure chaos infected by a seed of evil tossed there by "The Chained God" eons ago before he was imprisoned. As you travel "Down" toward the abyss, the bleed is more Chaos/Evil than bleed from another element. I have no problem with the concept of the Astral Sea with endless "Islands" serving as Godly domains and demi-planes. This I liked. In order to explain the 'weirdness' that happened to the planes in 4e, I say that the universe has a 'default' state; basically a cosmic 'soup' (the Ginnungagap) where everything exists in a state of Chaos. In the beginning there was an event (Big Bang Theory) wherein the the 'soup' gained consciousness and drove-out the chaos (this chaos had stopped it from achieving true sentience twice before - "third times the charm", or, "the law of three"). Basically, its burgeoning awareness felt the 'darkness' of insanity (pure chaos) creeping back in again, and said something like, "Let there be light! ", and drove the darkness back (the bubble in which exists the universe). Outside of that ever-expanding bubble is The Far Realms, and home to all sorts of aberrations. Its also home to all the 'Cthulhu' like Elder evils, the chief of which is Cthon, which is actualy the second 'being' (sentience) created (literally, all the chaos swept from the mind of the first entity became its opposite). Every other being - from the Supernals to the Ordials to the gods to mortals - are all part of this 'greater sentience' - small pieces 'sliced off' over the countless milenia, in a pyarid-like (bureaucratic) hierarchy. Thus, the universe was created out of chaos, and also out of confrontation - one being's struggle to pull its thoughts away from the chaos that threatened to consume it. The 'chaos' on the other hand, feels the universe itself is an aberration, and strives to return it to its original form. In the interim, all the dogma/divine intervention/cosmic catastrophes have helped to 'codify' (structure) the universe. So the Elemental Maelstrom is the universe's natural state, and when things like the Sundering occur, parts of it 'revert' back to this primal state. That is why we had separate elemental planes, and then we didn't, and now (I believe) we do again (although I think its still a hybrid of 'mixed' and unmixed' - completely separate elemental planes is unnatural and highly unstable). That's another peak behind the curtain of my 'Theory of Everything', in a highly abbreviated form. I have two 'maps' remaining on my DeviantART page which show my versions of both the 'Realm of Dreams' and my truncated version of the Great Wheel (also both very old, so they may not quite fit my current cosmological model). In my Wheel, I got rid of a lot of redundancy, and also spread the 9 Hells and 7 Heavens around (which is more in tune with my 'heaven above, hell below' philosophy). It also keeps it to just the 9 D&D alignments - everything else was unnecessary (IMO). The "hot" Feywild and the "cold" shadowfell slowly interacted, and thus the prime material was formed. Primordial entities were born into all of this chaos, and they dreamed, and from their dreams were created the outer planes. The Witches and people of Rashemen do not worship the standard Faerunian Pantheon. The people of Rashemen mainly worship a collective of three main female goddesses, though they also give reverence to special spirit beings local only to Rashemen. These spirits (known locally as Telthors, see new monster template in the new monster section) are ghostlike beings, being either beasts which seem to spontaneously appear or humanoids who died in service to the land of Rashemen. The people of Rashemen also hold the members of the various Fey Courts in high reverence as well (such as the Courts of Spring, Summer, Autumn, and Winter, the Unseelie Court, the Court of Green Fey, the court of Gloaming Fey <sometimes referred to as the Court of the Moon>). Of these courts, both the Prince of Frost and the Queen of Air & Darkness (whom some say is Auril) have become popular amongst the Bheur hags and certain rogue Wychlaran factions. The elemental lords, Kossuth, Akadi, Grumbar, and Istishia have also always enjoyed some reverence in the region, mostly due to their influence on the former empire of Raumathar. In addition, certain Faerunian gods have begun to make significan inroads, including Lurue and Nobanion, as well as the goddess Leira (whom some say is a daughter of �The Hidden One� though who can tell the truth of such matters). Other deities have minor followings, for instance amongst the males, Gond, Helm, Hoar �the Doombringer�, and Tempus all have limited followers. 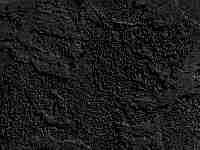 Amongst the hags of the region, deities such as Beshaba, Cegilune, Kiaransalee, Shar, and Talona all have followers, as well as those who follow the Queen of Air and Darkness. The true nature of �the Three�, Bhalla, Khelliara, and �The Hidden One�, is a mystery. Westerners believe them simply to be aspects of Chauntea, Mielikki, and Mystra. Some others have posited that they are remnants of the ancient Yuir deities once worshipped by humans in the region. Others believe they are some form of Archfey, Primordial, or simply powerful Spirit being leftover from the early days of Toril. Still others claim that Bhalla, with her cow representation, is related to the being that giant mythology claims nursed the original giant deities, and that Khelliara, with her deer representation, is related to an ancient being of Shaundalar mythology known as Flidais. Some say that the earthmother of the Moonshaes and Bhalla are one and the same, and that Chauntea is attempting to usurp them both. Still others believe that Bhalla and Khelliara were racial deities of the Hybsil and Minotaurs who were adopted by the humans of the region, much as Felidae, the cat goddess, had been before being subsumed by Bast. Rashemi doctrine says that Bhalla is a mother goddess who it is said was around at the founding of the world as a great cow amidst a sea of icy rime. From the elemental chaos, heat slowly came to the darkness, causing the salty rime in which she found herself to begin to melt. It is said that this icy salt did melt enough at one point that it became a sea around her, and in the process somehow the salty sea did make her become pregnant. Bhalla then gave birth to a set of twins, Khelliarr and Khelliara. Khelliarr was a power of great light and love, but he did not survive these early times. Khelliara would go on to become a wild power of nature and hunting, with a particular affinity for snow and skiing. Bhalla has given birth to other children by other powerful beings (such as Magnar the Bear, Relkath of the Infinite Branches, Skerrit the Forester, Talisid the Celestial Lion) but the names of most of these children have been lost to history for the most part, though some are still called upon as powerful spirits within Rashemen. She has even given birth to some unusual races, such as the small, singing mushrooms known as Campestri, said to have been birthed upon her by the Carrion King of the Feywild in return for a favor. The Rashemi truly believe that the Mulhorandi goddess Hathor is simply an aspect of Bhalla, and that this is why the other Mulhorandi gods look down upon her. The Mulhorandi of course consider this sacrilege. The original Rus who arrived in Rashemen referred to Bhalla by the name Audumbla and were surprised by the reverence given her by the local populace, but as they bred with the Raumviran population and learned their ways, proper reverence for Bhalla was soon as natural to them as breathing. Khelliara is seen as a similar goddess, though she is seen more often as a huntress and master of Forests. She is known to take the shape of a red deer, and some suspect that PindalPau-Pau, the Reindeer Mother of the people of the Great Glacier is actually an aspect of Khelliara. However, she is also known to take on the shape of wild red mares, red falcons, red foxes, and wily reddish-brown rabbits. Many believe that Mielikki and Khelliara are one and the same, and perhaps over time this exchange has occurred, but the Rashemi steadfastly refuse to believe such. It is said that Khelliara is served by �the Hart Maidens� or women spirit warriors who can and do take on the forms of female deer to provide spiritual guidance to the people of Rashemen. Some believe these Hart Maidens also choose which heroes of Rashemen will become the spirit beings known as telthors. The original Rus who arrived in Rashemen referred to Khelliara by the name Freyja and named her Hart Maidens to be Disir (of course, they also referred to the outlander deity Lathander by the name Freyj). It is also whispered that Bhalla nursed Annam, All-Father of the giant pantheon, at her teats when he was young and weak, and she was rewarded for her kindness later when he was stronger by being raped by him. Annam did announce that he would return to collect his child upon its birth. It is said that Bhalla did curse Annam for this, calling upon great powers of the fey for their protection. When the child was born, it was a misshapen and ugly female child, and Annam did appear, and in his fury he threatened to throw the child into the Pit at the bottom of the Elemental Chaos. Bhalla did call upon the Queen of Summer, Khelliara did beseech the Queen of Winter, and the child did innately call upon the Queen of the Hags. These three beings appeared to provide their blessings and protections upon the child, and they did tie the child's spirit to all the lands of Northeastern Faerun, the land of Arvandor, and the Feywild and did tie all this magic to the movement of the moon such that it is constantly changing. This prevented Annam from hurling the child into the yawning Abyss emerging from the Elemental Chaos. The frustrated Annam left, cursing all women as meddlers, but the child was kept safe. This child, it is said, is �The Hidden One�. Her true name is unknown to mortal men. What is known of �The Hidden One� is that she appears to be a great Telthor Spirit able to draw upon the many ley lines that cross through the land of Rashemen, as well as the magic of the moon as its movement causes these magical lines to ebb and flow. She has substantial power over Glamour Magic (illusions), elemental based magics and what is known as coven magic, or cooperative spellcasting. It is whispered that she taught the Raumvirans some of their original magic, though it is known that they also sought out other great elemental powers such as Grumbar, Kossuth, and other local spirits. It is also whispered that she once fell in love with the terrestrial bound Nanna-Sin of the Untheric Pantheon just a short time before Nanna-Sin's death in the Orcgate wars, and that she became pregnant by him, but she never revealed this to the Untheric Pantheon for fear that they would mount an invasion to take the child. It is said that this child is protected as a ward of one of the Faerie Courts, and that the Vremyonni protect a gateway to this realm. And thus why Leira truly is the most powerful god of them all... she just doesn't put on airs. Leira's greatest achievement, of course, it making people thinks she exists at all. If people stopped believing in her, she would simply 'fade away'. But isn't that true of all the gods? Are the gods themselves just delusions given form by mortal belief? And does it really matter if they are? The difference between Leira and the others is that she knows what she is, and how it all works. What you call 'putting on airs' just means she's a realist... which is the greatest irony of them all. I've also switched from 17 to 9 outer planes, after Pathfinder, those 8 redundant planes in between are like demiplanes now. One memory that strikes me about this "Perception creates Reality" concept is from reading Comics. Reed Richards of the Fantastic Four was put on Trial for saving the life of Galactus the World Eater. The trial was attended by hundreds of different alien races, and when Galactus himself showed up, there was a panel showing the dozens of different ways each Alien perceived him. This is what happens when people look at a Deity or other abstract entity. The mortal mind can't really process the enormity of what they are seeing, and so they "See" the "aspect" of that being that best fits their expectations. This makes it easy for Gods and such to reinvent themselves. Lets say there is a world where an Egyptian style society is destroyed and leaves so few survivors that the Pantheon is mostly forgotten. 3 Gods in the pantheon are able to survive and retain influence on this world by reinventing themselves. The Cat Goddess Bast sees what is coming and ushers some of her faithful to safety, keeping her faith alive with them when much of her pantheon fades from memory. Centuries later the warrior cat goddess is gone, but in her place is Bastet, Goddess of Luck, Joy, and Hedonism. Isis makes a deal with a more powerful Northern God of Magic and Knowledge, agreeing to serve him as a new Goddess of Orderly Magic. She looses her domains of fertility and rebirth, but gains new prominence as guide to those who follow ordered and ritualistic forms of magic. For this reason, a great deal of old magic and knowledge from the empire is saved, and the Ankh, Hieroglyphs, and other characteristics of Egyptian style become a part of this worlds magical traditions. Meanwhile the last Egyptian God to remain in power on this world has found new followers by drawing worship away from a Primordial Serpent lord of Fire named Apep. He eventually weakens Apep enough that he banishes it from this world and replaces it as the primary God of the Serpent Folk. Tossing aside his jackal-headed form in favor of a new serpentine aspect, Set rises as Lord of Evil, Deception, Murder, and Serpents. While Set had not anticipated the actions of Bast or Isis, he has for the most part been successful in manipulating events. By corrupting the God King, convincing him to outlaw the worship of any god other than himself (even Set! ), and finally driving the insane God King to attempt an invasion of Heliopolis itself, Set puts into motion the downfall of this civilization. An enraged Ra strikes down the foolish God King and his unfaithful people (Most of whom had been bullied and terrified into turning from the pantheon), utterly annihilating their cities and slaughtering the vast majority of the Empire's populace. Those few who survive loose all remaining faith in the Pantheon and thus the Pantheon looses it's hold on this world. These 3 Gods have not only transformed their mortal following, they've transformed themselves and the very reality of who and what they are. By doing so they survive a cataclysmic dismissal of their pantheon from this world. If people stopped believing in her, she would simply 'fade away'. But isn't that true of all the gods? Are the gods themselves just delusions given form by mortal belief? And does it really matter if they are? The difference between Leira and the others is that she know what she is, and how it all works. What you call 'putting on heirs' just means she's a realist... which is the greatest irony of them all. That was so beautiful I think I may just cry... well said, goodsir, well said. As mentioned before, the planes are infinite, and beyond mortal comprehension. If a mortal experienced the flux of the planes, it would likely literally blow (or blow up) their minds. We (as mortals) can't comprehend it, so the Wheel or Tree are ways of "simplifying" it. I think it's why gods have avatars and appear to mortals in humanoid forms. They are forms we can understand. I agree to a point that reality is perception. I have thought about this a lot (in regards to the RW). My reality is different than your reality, even though we both exist in the same "reality". Your perception is different than mine. The gods rely on their followers, it is true. A god needs followrs, otherwise they wouldn't bother. A way to kill a god is to completely erase them from the mind of mortals (which would mean erasing all literature about them). However, as most gods likely exist on multiple planes, thus having followers on multiple planes, to truly destroy a god, you would have to erase every aspect of that deity on all the planes it exists in. A god needs followers, but they can survive for a time without them. In the case of a mortal becoming a god, they become a god before they have followers. Take Finder, for example, or Shevarash. Gods need followers to help increase their strength, but a mortal doesn't need to conjure up a deity before it exists. And deities will come from other planes, too, which I think is part of how they exist in multiple "spheres", if you will. Mortals and deities influence each other, I think, and mutual benefits. A god gets followers, worship, etc, and a follower gets spells (if a priest or cleric), a sense of purpose, and a place for their soul when they enter the Fugue Plane. While the needs of the mortal may or may shape the deity, a people are equally shaped by the personality of that deity. For example, say there was a tribe of people who deeply revered the wilds of nature. Along comes Silvanus, who is a god that is of this domain. Say this tribe of people is different than Silv's typical followers, but they nevertheless pay homage, and he accepts them. He may appear differently to them than he does to his other followers, as they have a different perception (they may even call him by a different name, unless he has given them his name). Their perception of Silvanus may be different, because of how they understand the world, but Silvanus could also also choose to show himself as he typically is, depending on how it would affect said perception. I think the gods are who they are, but they adapt themselves in order to make sense to their followers. And an opposing faith is going to paint the rival deity as monstrous/evil, because it is in opposition to them and their patron deity. Yes, the planes are (nearly) infinite and (nearly) beyond mortal comprehension. Many Powers, deities, gods and godlike entities exist across the planes, and many of these are absolutely locked within their own limited and mutually-exclusive perceptions or definitions of the universe - which suggests (to me) that the true nature and full scope of the entire (nearly) infinite cosmos also outspans even the most supreme and omniscient of god-like comprehensions. Yet D&D planeslore still lets us understand quite a lot, lol. Gygax's Great Wheel (aka the Great Ring or the Great Road), the Cosmic Tree(s), and the Astral Sea(s) are just the best-known cosmologies which attempt to explain or "map" the planes, though numerous variations of these (and many other) planar cosmologies also exist. A number of planar pathways exist - Mount Olympus (which ascends from many worlds to Olympus and the Upper Planes), the Yggdrasil World Ash (whose titanic roots and branches twine through many planes and worlds), the Planar Waterways (the River Styx winding through the Lower Planes, the River Elysium winding through the Upper Planes, and many other rivers with tributaries flowing into many corners of the cosmos), the Infinite or Eternal Staircase (which apparently leads almost everywhere), etc. Some of these are the foundations of major planar cosmologies and religions, they are themselves the roadmap to the planes. Others are recognized as "natural" features of the planes, "constructs" from major pantheons, or bizarre quirks of reality - but they do exist and so they are usually explained in some manner which doesn't violate prevailing cosmological models. Not to mention all the little transitive, overlapping, and convergent planes. The Shadowfell (Demiplane of Shadow) connects all shadows together, the Feywild provides kinship for all the Fey of all the worlds, the fogs of Ravenloft (Demiplane of Dread) can gather anywhere on any world to link fears and terrors together, the Plane of Dreams (and Nightmare Lands) can be entered by wandering minds. Portals, conduits, gates, shortcuts and paths between planes exist in countless forms - including Wormholes, Mazes and Labyrinths, Temporal Prime (the Demiplane of Time), the Bifrost Bridge, and the World Serpent Inn. I generally prefer 2E Planescape lore - it is incompatible with most 3E planeslore and all 4E planeslore, though each cosmology has its own merits. In Planescape, the boundaries between planes are often vaguely defined*, they do indeed blur together, and there are always in fact a (nearly) infinite number of "in-between" planar locations which allow people and things and weather and terrain (and the fundamental "laws" which define physics, magic, and faith) to move (at least with some effort) between them. So there are vortices (like the burning hearts of mighty volcanoes or the deepest fathoms of the oceans) which connect locations in the Primes with the Elemental Planes, and there are boundaries (based on subtle or symbolic differences of philosophy and alignment) which link locations (like sacred altars, stone circles, and pyramids) on many worlds to layers, Realms, or locations in the Outer Planes. The universe of planescape is built on belief, good and evil, law and chaos - few mortals have sufficient belief to impose substantial changes to their local environments, but Powers (deities, etc) and their religions can dramatically shape and reshape the "physical" properties of entire planes and Realms, along with any worlds (or universes?) they connect with. The Gate-Towns on the "edges" of the Outlands represent churning planar regions filled with potent alignment mixtures, they drift and bobble "between" the Outlands and "adjacent" Outer Planes, their "nature" and properties are blended and they can be reached from both sides, until (based on the prevailing belief and alignment of their populations) they gradually slide entirely into one plane or another. Travelling to different planes usually requires strong belief. In an alignment, in a philosophy, in a cause, in a loved one, in a god or a religion, in a technological invention or a magical spell. Travellers who are correctly "attuned" to their planar destination can cross planes by simply climbing a mountain, entering a forest, following the moonlight, or setting sail on uncharted waters. I think Planescape does a fine job of emphasizing this sort of "organic" planeswalking, while most other D&D planeslore is based on "tools" and contrivances - spells, prayers, rituals, magic, and items. In Planescape your belief is your roadmap - while the beliefs of others will lead you to unbelievable places. When the planes can be reached by any half-competent spellcaster or button-pusher, they become commonplace and mundane. But when the planes can only be grasped by worthy and ready souls, they retain more of their otherworldly, exotic, awesome, and terrifying aspects. * Although of course the Modrons of Mechanus would be utterly unable to comprehend (and be somewhat troubled by) this nonlogical notion: to them everything is rigidly defined, everything is self-evident, and everything must conform to Law or conform to non-Law (they also have great difficulty with the entirely nonlogical notion of "non-Law" itself, of course). So Mechanus might in fact be the only place in the entire cosmos which has absolutely and explicitly defined boundaries. Welcome to Planescape, where every exception has a rule. Except the latter half differs from the pattern set by the former (the World Serpent Inn "doesn't count", since it's artificial). There is 3e planelore? Beyond "maybe... or maybe not", "transitive planes - one, two... that's too many!" and "(heavy breathing) Far Realm! Hentacles! ", that is?